From star-filled constellations to dark ocean floors, one of the world’s largest museums boasts massive collections of fascinating discoveries. American Museum of Natural History, Upper West Side, Manhattan. 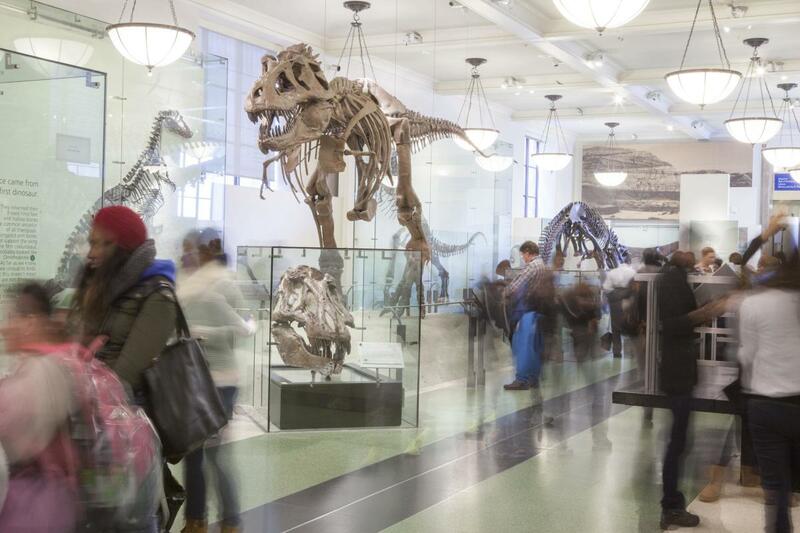 Located on Manhattan’s Upper West Side and across the street from Central Park, the perfectly situated American Museum of Natural History is a tourist hub for visitors from all over. The museum is divided into several wings, each of which houses a different exhibition on people, animals, waterways and space. It’s impossible to cover it all in one day. It is, therefore, best to start with permanent galleries, rotating exhibits and shows that pique your interests. You can also book specific, docent-led tours of the museum. To help you decide which areas to visit, listed below are some popular permanent exhibits you can expect to find when you journey through this world-renowned attraction. The Natural History Museum’s Rose Center for Earth and Space has all the universe’s latest discoveries. Entering through the 81st Street entrance of the museum will bring you to the Dorothy and Lewis B. Cullman Hall of the Universe. This modern gallery is equipped with different astrological stations, referred to as the Planets, Universe and Stars Zones. Each station traces the birth, life stages and current state of nearly everything floating around in space. Also on-site are a giant moon and real-life meteorite in a glass sphere encapsulating an experiment on environmental sustainability. More meteorites and glistening gem stones can be found in the Earth and Planetary Sciences halls. From here, groups can make their way to the 429-seat Hayden Big Bang Theater and Planetarium, a great opportunity to explore outer space through projected images and films of stars, planets, moons, meteorites and more. The Harriet and Robert Heilbrunn Cosmic Pathway, which tells the 13-billion-year-old story of the universe’s formation, will lead you out of the theater and into the David S. and Ruth L. Gottesman Hall of Planet Earth. As the name suggests, this gallery focuses on the land-and-water-filled miracle that provides life to 7 billion people and countless species. Akeley Hall of African Mammals, American Museum of Natural History NYC. Courtesy of Marley White. Visit the Mammal Hall exhibitions to marvel at captivating walk-through dioramas of the world’s most magnificent species. Based on scientific observations, these accurately sculpted, life-sized animals are divided according to country of origin and, even more specifically, according to size and preferred climates. The Bernard Family Hall of North American Mammals boasts a massive collection of bears, bison, moose, wolves and sheep, as well as smaller animals such as beavers, skunks and squirrels. More displays of the little ones can be found in the Hall of Small Animals. Moreover, the Natural History Museum preserves wondrous creatures from all over the world. 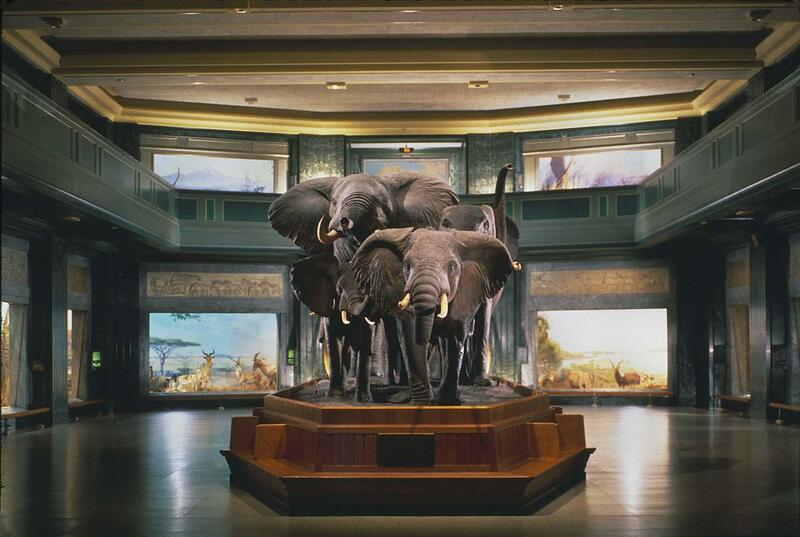 Get a feel for life along the Nile River and on the Serengeti Plain by touring the Akeley Hall of African Mammals. Here, you will come across majestic elephants standing side-by-side and African lions assembling together for protection. Mighty gorillas can be seen thumping their chests in efforts to take charge of intricately-designed jungles nearby. The Hall of Asian Animals consists largely of endangered mammals from Thailand, India and Myanmar. Among them are a giant panda and Siberian tiger, both of which are frequently hunted in their homelands. Hall of Biodiversity, American Museum of Natural History NYC. Courtesy of Marley White. If you’ve never probed pitch-black ocean floors or ventured through a rainforest before, you’ll have the chance to do so at the museum’s Biodiversity and Environmental Halls. A museum favorite is the interactive Irma and Paul Milstein Family Hall of Ocean Life exhibition room. Spanning two floors, this 29,000-square-foot space boasts over 750 aquatic animals. The most obvious of these creatures is a majestic 21,000-pound, 94-foot-long blue whale hovering above all the excitement. Walk along the gallery’s dioramas to witness how a giant squid, anemones, dolphins, walruses and sharks navigate icebergs, coral reefs and rough currents. You can observe more sea creatures in their natural habitats on the exhibit’s large projection screen and at various computer stations. Next, wander through a magnificent rainforest modeled after central Africa’s Dzanga-Sangha Rain Forest in the Hall of Biodiversity. Similar to the Hall of Asian Mammals, this exhibition is also committed to preserving endangered species. Surrounding the rainforest are dioramas and replicas of the hundreds of animals fighting for their survival. 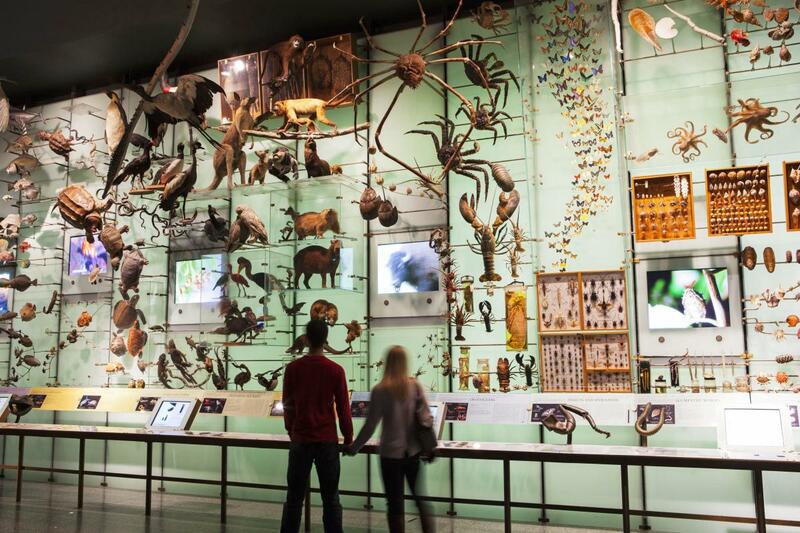 The Spectrum of Life’s wall displays bring together about 1,500 animals and plants to show how they are all ecologically interconnected. Hall of Saurischian Dinosaurs, American Museum of Natural History NYC. Courtesy of Marley White. Other must-see exhibitions at the museum are the extensive dinosaur halls and fossil collections. In particular, the David H. Koch Dinosaur Wing is home to two major galleries filled with dinosaur skeletons. Wander through and snap photos with stegosauruses, triceratopses and more in the Hall of Ornithischian Dinosaurs and the Hall of Saurischian Dinosaurs. The Hall of Primitive Mammals provides fossil prints and early skeletons of animals we now know as cats, horses and snails. As you revel in these dinosaur and mammal bones, don’t forget to visit the Miriam and Ira D. Wallach Orientation Center, home to the world’s largest known dinosaur. Stretching 122 feet long, the towering titanosaur extends its head outside the gallery’s entrance in salutation. The center also showcases centuries-old fossils of nearly every kind of dinosaur, including a partial skeleton from the late 1800’s, in the Big Bone Room. Answer the age-old question of how humans came to be in the Hall of Human Origins. Included in this hall are evolving anatomical structures from the Anne and Bernard Spitzer Hall of Human Origins, plus galleries divided according to people from different regions of the world. The oldest of these exhibitions is the Northwest Coast Hall, which provides information about early North Americans’ travels through the continent’s upper regions. Collections on Native Americans Indians and Pacific Islanders, equipped with weaponry, headdresses and cooking utensils, are also available. International exhibitions, such as the Hall of African Peoples and the Stout Hall of Asian Peoples, feature not only people, but their traditions as well. Included in these finds are vibrant Nigerian festival costumes and a silky chair used in preparation for Chinese weddings. The Hall of South American Peoples reveals Incan artifacts and burial customs. Some of the Natural History Museum’s galleries comprise elements of New York, whether they are animals you can find roaming the city or historic representations of the environments they thrive in at the Hall of New York State Animals and the Hall of New York City Birds. Visitors will additionally learn more about the formation of New York’s topical landscapes, such as the Hudson Valley, Apple Orchard and Stissing Mountain, and how human actions impact them in the Felix M. Warburg Hall of New York State Environment. Another exhibit honors a local and national hero. The Theodore Roosevelt Memorial Hall commemorates New York’s 33rd governor and the 26th U.S. president with a life-sized bronze statue of him sitting upright and ready for action. Tributes to Roosevelt continue in a rotunda filled with recovered documents and 5,200-square-foot murals of key moments in his life. Surrounding these artifacts are more displays of dinosaur skeletons, since Roosevelt himself was an advocate for animal safety and preservation. Finish your tour with a meal from the museum’s downstairs cafeteria or a savory New York hot dog from any of the stands outside. Conveniently located downstairs is the subway, ready to take you anywhere else you need to go. For more information about the American Museum of Natural History in New York, visit www.amnh.org.